Daily Survival: INSTANT SURVIVAL TIP: Mylar Rules! Four of the five enemies of stored food can be conquered with the use of mylar bags. 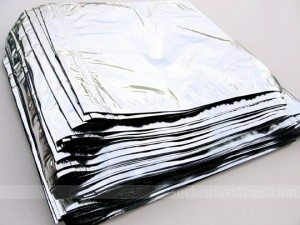 This great material does a mighty job of protecting your food from light, oxygen (if you toss in an oxygen absorber), pests, and humidity. The only enemy it can’t protect against is heat; that’s your job. If you know what a mylar balloon is, just think stronger and thicker, and you have mylar for food storage use. Storing wheat in large mylar bags is common, and many companies such as Walton Feed sell their buckets of wheat with a mylar liner. (Check out the video below.) By snipping off all or part of the sealed end, you can access the food inside and then reseal with a clothes iron or a Food Saver. One reason mylar is so popular is because it can be re-sealed over and over. Just remember to add a new oxygen absorber each time. Unless I don’t plan on opening a bucket of wheat or other food for years, I really like the options small mylar bags provide. Think about it. Smaller quantities allow for more frequent rotation and are smaller and lighter than heavy buckets. In an evacuation, these smaller packages would be easier to grab and pack. If you make your own dehydrated food mixes, they can be sealed in small mylar bags and then re-used. For organization, store the bags in labeled bins or boxes. You can still stock up on large amounts. The only difference is in the quantities stored in each container. I’ve checked around on the internet, and these smaller bags, in small quantities, aren’t that easy to find. One of my sponsors, Be Prepared Now, sells a package of ten mylar bags and ten oxygen absorbers. The bags hold the same amount as a #10 can. You can check it out here.